&Stitches: Floss organisation: Frame it! How wonderful is this? Functional and pretty at the same time. Marie Tretiakova organises her floss on clothes pegs with small hooks glued on, hanging on wire in a frame. Back in January when I was exploring floss organisation options I stumbled upon Marie's special way of storing her floss. "I used some old wooden frames I had at the house, and put the small screw in eyelets in the sides. I used framing wire to string between them. It wasn’t easy getting it taut, but it was possible. I used needle-nose pliers helped because that wire is super slippery. I strung the wire across and then down to the next level and tied it off." 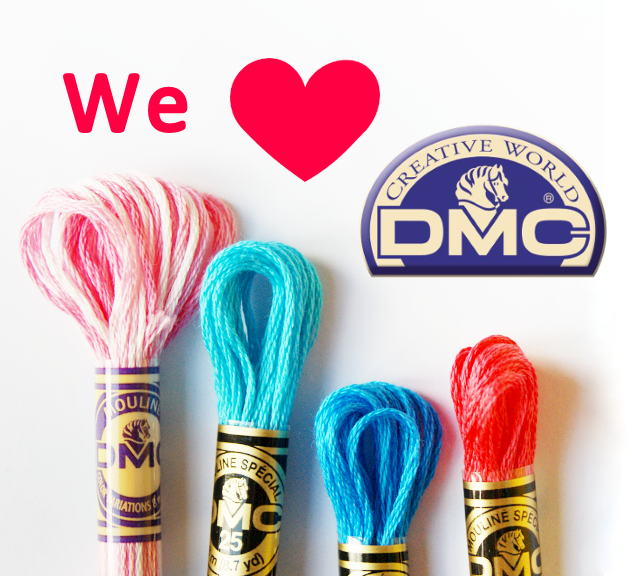 "I wind the floss on the bottom, marking it with the DMC number. This way when I run out of a specific thread, I know which to purchase by looking into my basket, or rather throwing the basket in my purse and looking at the pins at the store"
Thank you Marie for sharing your original way of storing floss with us! This is so clever! My mum gave me the DMC zip-up floss organiser / holder which looks great in theory but which is actually an absolute nightmare! I love the fact that this version not only organises the floss but is also a very pretty wall feature too. I might just go and buy some pegs now! !